« Should Politicians Get a New Tax Without First Abolishing an Existing Tax? Can we have a detailed explanation of how the information in the graph has been derived? The US Census has many figures, most of which don’t go back as far as 1959 and none of them going any further back. Links, resources, etc would be greatly appreciated. I’m a liberty-minded person and I wish to be better able to defend these ideas. Anything to do with Liberal bias is not accidental. Reporters such as this one are schooled to misread statistics and use them to support their ideology. The statistics don’t have to be accurate. They just have to be usable out of context or simply fabricated..
By more redistribution, of course. The vicious cycle of HopNChange closes. There is no return from Europeanization. Many one cultures have been unable to resist this siren song to decline. The script will reliably play once again, this time for America whose citizens took their superior prosperity for granted and embarked on a quest to mimic the rest of the world, primarily Europe. Three billion people have awakened, and the Western world is reacting to the competition by decreasing incentives to engage in exceptional work. Collectivism and an environment of solidarity is a natural reaction and may provide comfort in decline, but it is exactly the wrong prescription, so the writing is on the wall. Being in the middle class of a country whose standing in the world is declining means that your once envious standard of living is converging to the world average. In anything but the short term, this relentlessly compounding effect dwarfs the cacophony of all other politico-economic minutiae that pervade the news and political campaigns. Temporary, small, and confusing revivals aside, the path Americans have charted for themselves is one of Europeanization and decline. this entire issue is a joke……….The “Renewable Fuels Association/EPA cabal” are just as guilty of murder as is the Denver shooter…….preplanned infanticide. There is no potential food shortage at all. 42% of Americas biggest cash crop, corn, is sent down the rat hole called the ethanol program. 39 million acres wasted. 78,000 btus of energy used to produce a gallon of ethanol that contains…74,000 btus of energy. The only parallel would be Chairman Maos program of melting down pots and pans to make more pots and pans. An ethanol “industry” that consumes, from production to processing, more fresh water than the sanitary needs of every man, woman and child in the country. The corn ethanol producers don’t even believe their own narrative any longer, regardless. It’s now a “national defense” issue. The Renewable Fuels Association, in Des Moine Iowa of all places, is literally frantic over calls in Congress to limit or end the scam in light of the drought. It should end……….according to UNICEF, 3 million Black infants will die on the African continent this year because of corn price increases. The ethanol program is not only an economic fraud….it’s murder as well. But, it has its supporters—like the erstwhile Republican Senator, Chuck Grassley, member of the Senate Ag Committee …..who farms 4000 acres of Iowa corn ground-and loves the mother of all subsidies: The Federal Crop Insurance program. Besides, the cows and chickens would really appreciate it if the corn ethanol program….was put out to pasture. And by the way, without the ethanol handout, John Deere is a $42.00 stock. on July 25, 2012 at 9:50 am Jim H.
More specifically, are there numbers that define poverty per person, family, etc. Who publishes the numbers? And what are they? It’s a moving target, otherwise it would be closer to zero. I understand that most of those in poverty have a colour TV, etc… Much of the third world would love to be in poverty as defined in America! Fantasy numbers just like politician’s budget cuts! on July 25, 2012 at 9:07 am Jim H.
When I see reports on poverty, I often wonder how it is defined. 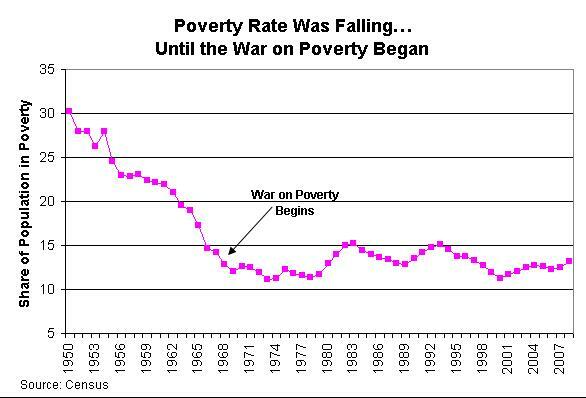 Is there a stable, sensible definition of “poverty,” or is it a moving target?